What does Scaled Agile Marketing mean? So, assuming you’re thinking Agile Marketing can help you with some of your marketing challenges and there’s a good opportunity to do something about it right now, and there are some reasons you think you need to consider some scaling aspects, let’s try to see what scaled agile marketing looks like. The first thing about Scaled Agile Marketing is that it isn’t just about Agile. It’s also about Lean. Lean focused on Value, which is similar to “Customer Focus” in the Agile Marketing Manifesto. It adds pillars like “Respect People and Culture”, “Flow”, “Innovation” and “Relentless Improvement” that are somewhat missing from the Agile Marketing Manifesto although you kind find some hints of them in the principles behind the manifesto. The most important addition is “Leadership”. To achieve a transformative move to being agile requires more than just practices at the team level. It requires both application of scaled practices but even more importantly a different style of leadership that focuses on creating clarity around purpose, decentralizing control, enabling and developing people, creating a safe-to-learn environment. If you “Respect (and understand) People and Culture” you understand that culture is hard to change. It’s actually the last thing to change. So changing leadership culture is a huge challenge. In order to tackle it a lot of our focus on training and coaching throughout a real agile marketing transformation should be on teaching leaders how to think and act differently in ways that support/enable agile marketing behavior rather than detract from it. Beyond a high-level Lean/Agile mindset, there are some additional principles we need to take to heart in order to succeed at scaling agile marketing. Why do we need principles? Why not jump to practices? Because we’re dealing with snowflakes. What does snow have to do with anything? Each snowflake is different. Each organization is different. So despite the fact that we might have some good practices that can help us scale we want to understand the principles underlying them so we can know what to do to inspect and adjust our agile marketing approach to find the best fit for our purpose and context. 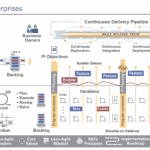 There are various sets of principles you can look at – Scaled Agile Framework (SAFe™)’s Lean/Agile Principles or Large Scale Scrum’s (LeSS™) Principles. Some of my personal favorites are principles like “Decentralize Decision Making”, “Reduce Batch Sizes”, “Systems Thinking – Or Optimize the Whole”, “Empirical Process Control”, “Apply Cadence, Synchronize with cross-domain planning”, “Assume variability, preserve options”. It’s not a book I would recommend to marketers but maybe someday someone will write a more approachable version of Donald Reinertsen’s Principles of Product Development Flow (That has been the inspiration to many of the above principles and also a lot of my work personally whether in Agile Marketing or organizational agility in general). Nothing beats an Agile Marketing team – but what if a team isn’t enough? In the “What is Agile Marketing” article I talked about the small Agile Marketing team that is autonomous and customer-focused as key to Agile Marketing success. Before talking about scaling we need to make sure we understand when would a single agile team isn’t enough. The Scrum Guide provides the most popular guidance for how to structure agile teams. “Small enough to remain nimble and large enough to complete significant work <…>. Fewer than three Development Team members decrease interaction and results in smaller productivity gains …. Having more than nine members requires too much coordination … too much complexity”. Amazon’s Jeff Bezos coined a more colorful variant – The Two Pizza Team. “If your team can’t be fed on two pizzas, then cut people.” That limits a task force to five to seven people, depending on their appetites. (The original comes from the world of developers, so might require some adaptation for the typical marketer’s appetite?). So, what if in order to encompass a large customer experience/journey one such team of up to 5-9 people isn’t enough? This can certainly happen if we’re talking about large businesses or products with dozens of marketers that focus just on one line of business or experience. Especially when we’re a very specialized marketing organization where in order to deliver the full experience we need more than a handful of people. Do we grow the team so that everybody that needs to work on the experience is on it? There’s a limit to the reasonable size of a team before communication and collaboration gets unwieldy and before team members start to lose themselves inside the team and don’t have the same sense of accountability, ownership and purpose anymore. Do we require more full-stack/t-shaped marketers that can each cover a couple of specialities and can therefore deliver the entire breadth of the experience with less people on the team? ideally yes, but that is typically a major transformation both from a mindset as well as skills/experience on its own. Most organizations cannot assume this when starting their Agile Marketing journey. When it is impossible to actually deliver the whole value with one team, the pattern most often used is to create an agile “Team of Teams”. What differentiates an “Agile Team Of Teams” from just a “Team of Teams”? The “Agile Team of Teams” applies intra-team Agile principles and practices to the inter-team challenge. In this context each team is similar to a single team member in the team-level agile practices. For example if team-level agile has a Daily Scrum practice, in the agile team-of-teams there’s a “Daily Scrum of Scrum” where each team is represented and together the teams figure out how best to work towards their common goal that cuts across the “Team of Teams”. If there’s a team-level “Sprint Planning” event there’s a somewhat comparable “Team of Teams” planning event where teams work together to figure out what they should focus on in the next timebox, what are the key integration points, risks, etc. This is an example of applying the same “Cadence with cross-domain Synchronization” principle at both the team and team-of-teams level. Different frameworks have different perspectives about how to work at the team-of-teams level. For example Large Scale Scrum has a team-of-teams planning event every sprint with representatives of the different teams synchronizing before going off to plan their own sprints at the team level. Scaled Agile Framework prefers a less frequent but wider attended “Program Increment Planning” event that is also often called “Big Room Planning” because it means bringing the whole team-of-teams (Called an “Agile Release Train” or “Agile Marketing Train” adjusted to marketing) into one big room to synchronize on a cadence of every 8-12 weeks. Figuring out which approach is a better fit for your context is something you will need to figure out based on your reality – your market, your people, the amount of interdependence between teams, the level of distribution/co-location. This is actually one of the things I enjoy the most – helping an organization figure out what scaling approach makes sense for their context. Classic Agile talks about the product owner who is accountable for figuring out the ideal Product Backlog to maximize business value delivered by the product and overall profit from it. In a marketing context we talk about the Marketing Owner who tries to figure out the ideal Marketing Backlog to maximize business value that is achieved by impacting the customer buying/owning journey. What happens when there’s a team-of-teams? can one Marketing Owner still guide the whole team-of-teams? Some scaling frameworks (e.g. Large Scale Scrum LeSS) say yes (with considerable help from the teams when it comes to writing stories and some of the more tactical work of the Marketing Owner). Other frameworks (e.g. SAFe) say it isn’t realistic and separate responsibilities between a more strategic “Marketing Management” role (or Product Management in a development context) and a more tactical “Marketing Owner” that works more closely with 1-2 teams in a certain area. What is planning sprint to sprint isn’t enough? What if you need more predictability? Scaled environments frequently come with a need for more predictability. It’s a “nature of the beast” of how bigger organizations plan and coordinate internally and with their network of partners. Yes you could argue for moving to a more “agile” internal/external contracting model and that would work in some contexts. When we look again at the market majority – you’ll find you need to work within constraints that might not be flexible especially if you haven’t proven you have a better alternative before dismantling them. So some scaling frameworks provide an ability to do “Agile Roadmapping” which isn’t necessarily an oxymoron. An Agile Roadmap provides some predictability where it’s key and leaves enough flexibility to take advantage of emerging opportunities and deal with variability in general. Agile teams run retrospectives. Agile Team of Teams run retrospectives or inspect and adapt workshops or Kaizen events that span the whole team of teams. Whether every couple of weeks or less frequently, whether everybody attends or just representatives from each team, this “whole system” improvement activity is crucial to identifying and doing something about the key systemic impediments that hinder further and faster improvement in the agility of the organization. Lean/Agile leaders should consider these impediments one of their key focus areas not just in the improvement meetings but day to day. They need to relentlessly seek ways to improve the ecosystem the teams need to work within. One of the lean principles that’s crucial to scaling is visualizing and managing end-to-end flow. Flow typically leads us to Kanban but here what we mean is using Kanban to manage the flow at the higher levels of the organization – the flow of campaigns/programs and maybe even higher-level initiatives in the marketing strategic portfolio. Managing the flow at this level is a great way to apply “Whole System Thinking”, teach marketing leaders about the importance of Focus, the courage needed to say “Not Now” and to actually prioritize a few things so you can “Stop Starting Start Finishing”. This is a prime example of a practice that is a great lever point to affect organizational behavior starting with leaders. A small change in behavior at this level can be harder than making multiple changes at the team level but can setup agile marketing teams for the win. We started this article with the importance of Lean/Agile leadership to succeeding with Agile Marketing at scale. Let’s finish it here with this example of how to concretely work with marketing leaders to creating a healthier more sustainable AND value-oriented flow throughout their marketing organization. As I mentioned these are just some of the key practices applied when scaling agile marketing but they should give you some idea about the scope of the principles and practices beyond just a team-level Scrum/Kanban agile marketing context. And even more important, as you grow in size you grow in complexity and uncertainty around what process would best fit you. In the current level of experience available in the industry that typically means you should get somebody with experience in what they’re doing to help you figure out the right scaling approach.